Jamshedpur, Sept. 7 (The Telegraph): A social entrepreneurship course at XLRI now comes with an internship with national-level NGOs. The B-school has introduced internship in the curriculum of social entrepreneurship, an elective course, from this year after the success of Parichay, a social entrepreneurship venture, last year. “From this year onwards, the curriculum of the course includes an internship programme. 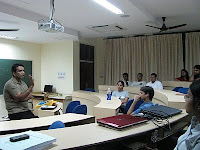 The idea is to enable students to know how an organisation functions. Every student will have to complete a project to learn the challenges in the area,” said Madhukar Shukla, a faculty of social entrepreneurship. About 14 students have already begun their internship in NGOs such as Pravah, Prayas, iDiscoveri in New Delhi; Aarambh in Bhopal; Helen Keller Institute of Deaf, Blind and Dumb, Mumbai; SEWA video in Ahmedabad and a few based in Jamshedpur such as Ujjivan and Kalamandir. The course has also undergone a change from this year. Instead of the one-term course, social entrepreneurship has now become a two-term (six month) one. “The purpose of the internship is to help students gain a first-hand experience of working in a social venture, in a sector of their choice. This learning will also help them to develop their business plans and acumen for latter part of the course,” said Shukla. From this year, students were also made to do a field work that comprised meeting with hawkers, rickshaw pullers, slum-dwellers, etc., and door-to-door visit to see their lives close quarter. “The visit has been made compulsory because most of our students come from urban middle class and if they want to bring a change, they will have to understand the lives of the downtrodden, their situation and economic condition,” he said. “We may not earn like other management students but will be able to bring about a social change. In order to start a social venture, we need to have a vision and the internship will also make us learn about the hiccups,” said Nidhi Rawal, one of the students of XLRI who is interning at Ujjivan Microfinance in the city.